Hot on the heels of U.S. President Barack Obama’s push into Syria, Saudi King Abdullah bin Abdulaziz is said to have cut short his private visit to Morocco to return to the kingdom overnight. The monarch and his entourage have already left Morocco, according to Naharnet news portal. The news follows reports of the Saudi military command ordering an “above normal defense readiness” at the kingdom’s largest air force base in Tabouk, close to the Jordan-Saudi border. Observers associate the developments to the Syria war. Two senior Western diplomats in Turkey told Reuters today the United States is studying setting up a limited no-fly zone in Syria close to the southern border with Jordan. Their comments, confirmed by a third regional diplomat, came after the White House said overnight it would step up military assistance to rebels battling President Bashar al-Assad in response to proof of chemical weapons use by Assad forces. 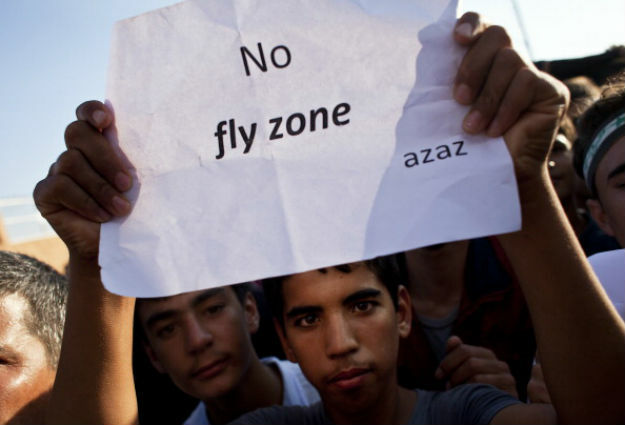 "Washington is considering a no-fly zone to help Assad's opponents," one diplomat told Reuters. He said it would be limited "time-wise and area-wise, possibly near the Jordanian border," without giving details. U.S. military planners, responding to a request by the White House to develop options for Syria, recommended the limited no-fly zone along the Syrian border to protect rebels and refugees inside Jordan. The plan, according to the Wall Street Journal, would create what one official called a "no fighting zone" that would stretch up to 25 miles into Syrian territory along the Jordanian border, preventing Assad forces from launching attacks against the rebels and refugees and protecting U.S. personnel involved in distributing weapons and providing training. Under this plan, the U.S. and its allies would enforce the zone using aircraft flown from Jordanian bases and flying inside the kingdom, according to U.S. officials. Jordan has been inundated by a flood of refugees Jordanian and U.S. officials say is a growing threat to the kingdom, a key U.S. ally in the region. The U.S. has already moved Patriot air defense batteries and F-16 fighter planes to Jordan, which could be integral to any no-fly zone if President Obama approves the military proposal. Proponents of the proposal think a no-fly zone could be imposed without a UN Security Council resolution, since the U.S. would not regularly enter Syrian airspace and wouldn't hold Syrian territory. U.S. warplanes have air-to-air missiles that could destroy Syrian planes from long ranges. The U.S. is to supply direct military aid to the Syrian opposition for the first time, the White House announced overnight. Ben Rhodes, spokesman for President Obama, did not give details about the military aid other than to say it would be "different in scope and scale to what we have provided before". He said, "I can't go through an inventory of the type of assistance we are providing but suffice to say it's going to be substantively different from what we were providing." The BBC's Jim Muir in Beirut says the White House announcement is one the Syrian opposition has been pushing and praying for for months. The Syrian opposition’s clamoring for U.S. arms peaked after thousands of guerillas from Iran’s Lebanese Hezbollah movement crossed into Syria last month to fight alongside Assad’s troops. NATO Secretary General Anders Fogh Rasmussen welcomed Washington’s “clear” statement. "Urgent that Syria regime should let UN investigate all reports of chemical weapons use," he said on his official Twitter feed. Rhodes, a deputy national security adviser to President Obama, said the U.S. intelligence community believed the "Assad regime has used chemical weapons, including the nerve agent sarin, on a small scale against the opposition multiple times over the last year". He said intelligence officials had a "high confidence" in their assessment, and also estimated that 100 to 150 people had died from chemical weapons attacks, "however, casualty data is likely incomplete". "We have consistently said the use of chemical weapons violates international norms and crosses red lines that have existed in the international community for decades," Rhodes said. He highlighted four instances in which the U.S. believes chemical weapons were used: on March 19 in the Aleppo suburb of Khan Al-Asal; April 13 in the Aleppo neighborhood of Sheikh Maksoud; May 14, in Qasr Abu Samra, which is north of Homs; and on May 23 in an attack in eastern Damascus. Rhodes said President Obama had made the decision to increase assistance, including "military support", to the Supreme Military Council (SMC) and Syrian Opposition Coalition. He did not give details of the aid, but U.S. media quoted administration officials as saying it will most likely include sending small arms and ammunition. The New York Times quoted U.S. officials as saying Washington could provide anti-tank weapons. Syria's rebels have been calling for both anti-tank and anti-aircraft weaponry. The Wall Street Journal said Washington is also considering a no-fly zone inside Syria, possibly near the border with Jordan, which would protect refugees and rebels who are training there. When asked whether Obama would back a no-fly zone over Syria, Rhodes said one would not make a "huge difference" on the ground -- but would be costly. He said further actions would be taken "on our own timeline." The CIA is expected to co-ordinate delivery of the military equipment and to train the rebel soldiers on how to use it. Until now, the U.S. has limited its help to rebel forces by providing food rations and medical supplies. Rhodes said the White House hoped the increased support would bolster the effectiveness and legitimacy of both the political and military arms of Syria's rebels, and said the U.S. was "comfortable" working with SMC chief Gen. Salim Idriss. "It's been important to work through them while aiming to isolate some of the more extremist elements of the opposition, such as (Jabhat) al-Nusra," he said. Obama and Putin will hold a one-on-one meeting on the sidelines of the summit of eight leading industrial nations early next week in Northern Ireland. The White House announcement immediately shook up the ongoing debate in Washington DC over how the U.S. might provide assistance to the rebels. Republican Senators John McCain and Lindsey Graham, who have been particularly strident in their calls for military aid, said the finding must change US policy in Syria. They called for further action, saying US credibility was on the line. "A decision to provide lethal assistance, especially ammunition and heavy weapons, to opposition forces in Syria is long overdue, and we hope the president will take this urgently needed step," they said in a joint statement. "But providing arms alone is not sufficient. The president must rally an international coalition to take military actions to degrade Assad's ability to use airpower and ballistic missiles and to move and resupply his forces around the battlefield by air." House Speaker John Boehner, R-Ohio, was also pleased with the decision and had a call for further action. "It is long past time to bring the Assad regime's bloodshed in Syria to an end," said Boehner spokesman Brendan Buck. "As President Obama examines his options, it is our hope he will properly consult with Congress before taking any action." And House Intelligence Chairman Mike Rogers, R-Mich., released a statement saying, "I am pleased that President Obama's Administration has joined the growing international chorus declaring that the Assad regime has used chemical weapons in Syria, crossing the red line drawn by the president last August." But Rogers doesn’t want the assistance to stop there: “As I called for in a USA Today op-ed earlier this week," Rogers said, "the United States should assist the Turks and our Arab League partners to create safe zones in Syria from which the U.S. and our allies can train, arm, and equip vetted opposition forces."